Jamie here to share a card using this month's spotlight Kiss Me a Latte! I used a few stamps from Give Me Coffee, colored and pop dotted them to the Card Mat Die base. 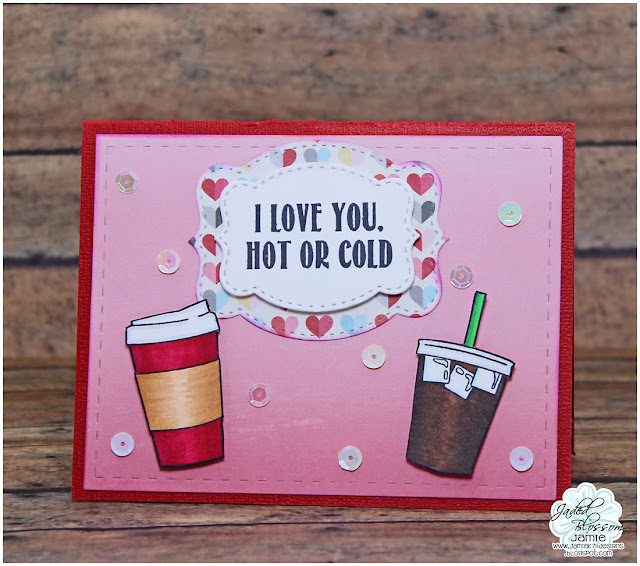 Then I stamped a sentiment from Kiss Me a Latte to a Label Shape Die and added another layer. Finished off the card with a few sequins! Love this set! thank you for the inspiration! I am ready to craft me some Valentine's Day treats! Beautiful card!! I love both of the coffees!! !